Peppermint is a cross between Mentha aquatica (Water Mint) and Mentha spicata (Spearmint). Peppermint seeds are rare and, when they do occur, they usually do not germinate. If a seed did sprout it would most likely be a less desirable form of mint. Sometimes we call these offspring "rank mints" because they can be foul tasting and have a very unpleasant odor. Our Peppermint is the variety most often used for peppermint oil production. It was originally obtained by us from the Mint Repository in Oregon and is sometimes referred to as Black Mitcham or Black Peppermint. Mitcham is a location in the United Kingdom where Peppermint has been grown commercially for oil production for centuries. 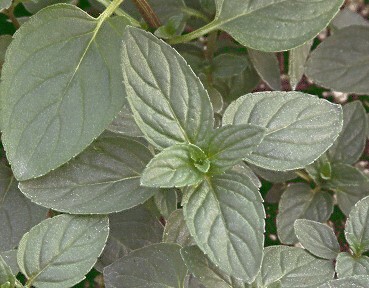 The climate there, which is cool and sunny in the summer, is ideal for mint. Even though mint prefers these conditions, with a little understanding, it can thrive almost anywhere in the United States. For instance, here in the Southwest, where we can have many summer days over 100, we give our Peppermint shade in the afternoon. While the mint does not mind our sun and high temperatures, it does mind going without water. Keeping the plants consistently moist is necessary to develop succulent stems. So to give ourselves a break from watering all the time, we grow it in partial shade. The key is to balance the amount of shade with the quality of the oil produced in the plant. Too much shade and not only does the flavor suffer, but the plant also becomes more susceptible to disease. You know your mint plant is in too much shade when the tall stems become lanky instead of rigid. Peppermint will also grow a lighter shade of green in too much shade. Variegated Peppermint is a little different and should be protected from sun that is too harsh. The white and cream sections of the leaves are very susceptible to sunburn. This normally doesn't hurt the plant but it is disfiguring and, if left unchecked, will cause the plant to grow very slowly or die. Because we always grow Peppermint in a container it is easier to find just the right spot simply by relocating the pot. Both Peppermints like to grow in well drained potting soil to which organic fertilizer has been added. Each plant needs as much room as you can provide. It is better to have a very wide container instead of a very deep one. Six inches is deep enough. There is never enough width! Most mints will need to be split up and repotted each spring to keep them healthy. See our Great Mint Repotting Caper for more on proper soil, division and replanting. Hortela is another name for Peppermint and this site has an amazing amount of medicinal information about this one plant. The first thing you notice is the incredible list of chemicals contained in the lowly Hortela plant. It is important to realize that all these chemicals work together to give Peppermint and, any other herb for that matter, its unique taste and healing properties. It seems impossible that a single element removed from the plant and inserted into a tablet, could possibly work as well as or have the same great flavor that the Peppermint from your own back yard does. 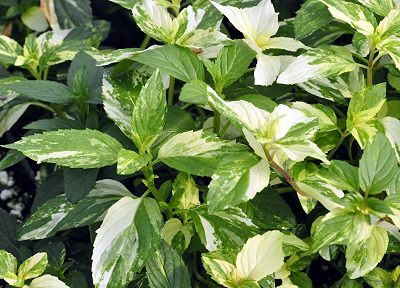 Variegated Peppermint like most variegated plants make for intriguing garden companions. Their highlights make darker plants pop and add an interesting complement to bright flower colors. There are two kinds of variegated plants: those that are a true species and those that are variegated due to a virus or other environmental factor. Most variegated herbs fall into this second group. These virus-infected plants are referred to as sports . A sport is a stem, or, more correctly, a bud of an all-green plant that goes awry and produces a variegated branch or stem. These mutations are often selected by growers, rooted, and given a new name (Variegated Peppermint, for example). Over time this kind of variegated plant may have both all-green and variegated stems. Since there is less chlorophyll (the energy making part of the plant) in variegated leaves, a sport propagated plant may be overcome by green shoots. Removing these green shoots when they appear will keep them from over whelming the variegated parts of the plant. Although Variegated Peppermint is a slower growing plant than Peppermint, these two do grow similarly. These mints have two phases of growth. The first occurs in early spring as it emerges from dormancy and sends stalks upward. These stems grow tall and will become flower spikes. If you are harvesting for drying, it is best to cut these stems just as the first few buds open. The flower on the left is really too old. The problem is not the age of the flower so much as the age of the leaves. As the leaves age the essential oils change composition and the flavors are not as pepperminty. So we use the stage of the flower to gauge the appropriate time to harvest the leaves. You can actually cut the stems at anytime but usually we like to let them get as tall as possible without waiting too long. The second phase of growth occurs after flowering. At this time the plant starts sending out long runners that stay at ground level. If these runners find moist soil they root and the plant gets bigger (thus the reason for the wide pot). Read our Mint Care and Tips page for more on how to tame your mint. Water Mint and Spearmint (Peppermint's parents) have quite a few forms and these forms have produced other Mentha piperitas that are worth adding to your collection. These include Orange Mint, Lavender Mint, Lemon Bergamot Mint and Chocolate Mint. Peppermints in all forms have a lot of menthol in them, which can be overpowering when the leaves are used fresh. We prefer the leaves dried. This mellows the menthol and makes them more palatable. It also makes it easy to blend with other dried herbs. For more information on choosing, growing, harvesting and using all of our mints, be sure to watch our mint podcasts. Peppermint and Variegated Peppermint make a great addition to our Tea Herb Garden Six Packs. This plant is often available in plug trays. These trays hold 128 of all the same plant. They are a great low cost way to fill a lot of space. Each cell is 3/4 of inch by an inch. Check here to see if Peppermint or Variegated Peppermint Plug Trays are available. Wash the mint, shake dry, strip the leaves from the stalks, and chop finely. Mix with the vinegar, salt, sugar and chili to form a paste. Drain the preserved ginger well, dice, and add to the mint mixture with the fresh ginger and garlic. If the chutney is too thick, thicken with 2-3 tablespoons cider vinegar. This is excellent on lamb or chicken.